As much as I love a good steak, a juicy burger, or a couple of slices of smoked beef brisket (recipe coming up next☺), it is nice to ease off and make a meal out of a salad. But this isn't just any plate of rabbit food with a drizzle of dressing. This is a summer salad at its finest. 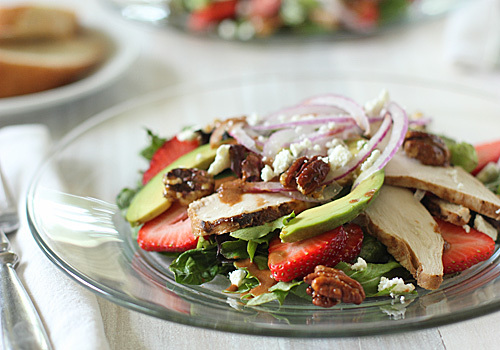 Ripe, juicy strawberries are arranged with sliced avocado, red onion, candied pecans, feta, and sliced grilled chicken that is marinated in a tomato-balsamic vinaigrette that absolutely explodes with flavor. 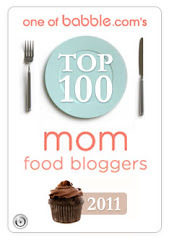 You might even find yourself dipping a piece of bread into it as it is passed around the table. Yeah, it's that good. The original recipe called for plain grilled chicken breast (or pulled meat from a rotisserie chicken as a time saver), but I like to marinate the chicken in a little bit of the vinaigrette before grilling it. The grill adds a nice smoky flavor that pairs well with the tomato-balsamic flavor. I also add sliced avocado to the salad because... I like it. The recipe called for candied walnuts, but I prefer the taste of pecans in this salad. You'll note when reading the recipe that it serves 4-8. If you have a hefty appetite and can polish off a whole chicken breast in a salad, then stick with the 4 servings, but since I serve this with some warm crusty bread and butter, our bellies get full. In fact, we like to make sure we have leftovers to stuff in whole wheat pitas or wrap in flour tortillas for lunch the next day. Combine the tomatoes, garlic, shallots, vinegar, and mustard in a blender and puree until smooth. With the motor running, add the oil in a slow, steady stream to emulsify. Add the salt and pepper and taste for seasoning. The vinaigrette can be covered and refrigerated for up to 5 days. In a non-stick skillet over medium low heat, add the sugar. Once the sugar starts to melt, add the pecans and toss to coat. Continue to cook until the sugar is caramelized and the pecans are toasted and coated in the sugar. Transfer the pecans to a sheet of parchment paper and carefully separate the pecans using two forks. Allow the pecans to cool completely. Pecans can be made up to 5 days in advance. In a resealable plastic bag, combine the chicken breast and 1/4 cup of the vinaigrette. Marinate the chicken for at least 1 hour. Meanwhile, prepare a charcoal or gas grill for medium-high heat. Remove the chicken from the marinade and season with kosher salt and freshly ground black pepper. Lightly oil the cooking grates and grill the chicken until cooked through, about 6-8 minutes per side. Remove the chicken from the grill and cover lightly with a sheet of aluminum foil; let rest for at least 20 minutes. Chicken can be made up to 1 day in advance. When ready to serve, thinly slice the chicken. In a large bowl, toss the spinach and greens with 1/2 cup of the vinaigrette. Season to taste with salt and freshly ground black pepper. Divide the spinach among chilled plates. 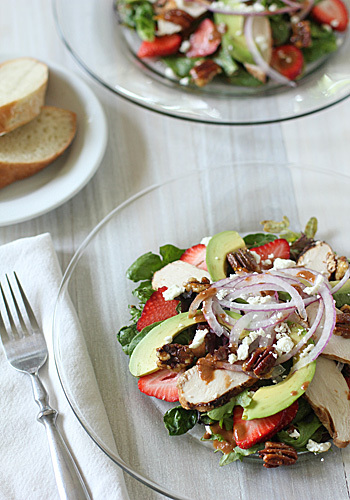 Arrange the chicken, avocado, strawberries, and onion on top of the greens. Sprinkle with the feta and candied pecans. Drizzle a little of the vinaigrette over the chicken and serve immediately. Enjoy! Looks absolutely perfect for a hot summer night! super lovely salad - I think this could be dinner - delicious, love the addition of spinach and avocado. This looks great! Can't wait till I move my grill to my new house so I can give this a try! Just finished eating this. My husband says it's the best salad he's ever eaten and my chilren (16, 12, 9) even THANKED me for making it! Served with a homemade french baguette.